Well hello there! 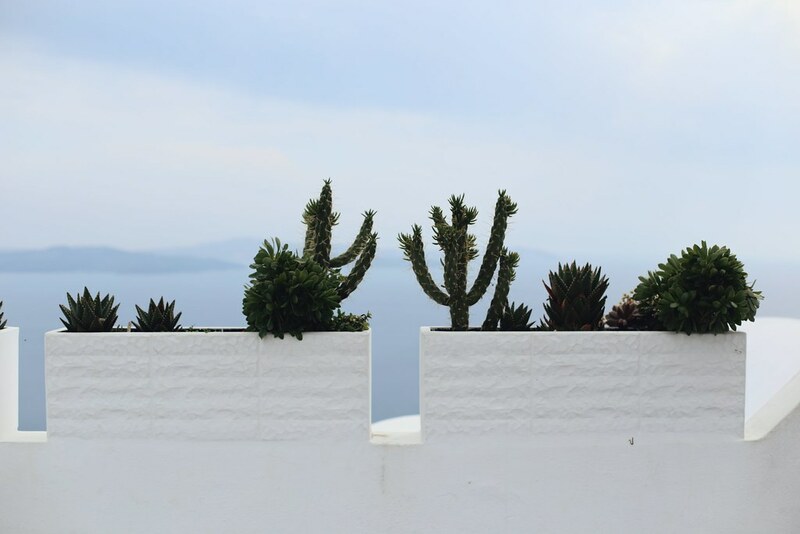 Today's post is a travel one, which is something I haven't actually done in a while, have I? Which is weird considering they're my favourites to put together. However, like I was saying in this wee post here, they do take me absolutely ages to put together (I always want to get it exactly right and make sure I show you the place as close as possible to the way I experienced it meself, which normally results in me taking about three weeks and 547 cups of tea to write one up) so that perhaps explains the lack of them recently on here. But that void will soon be no more, as I have a whole host of them coming at you this month! 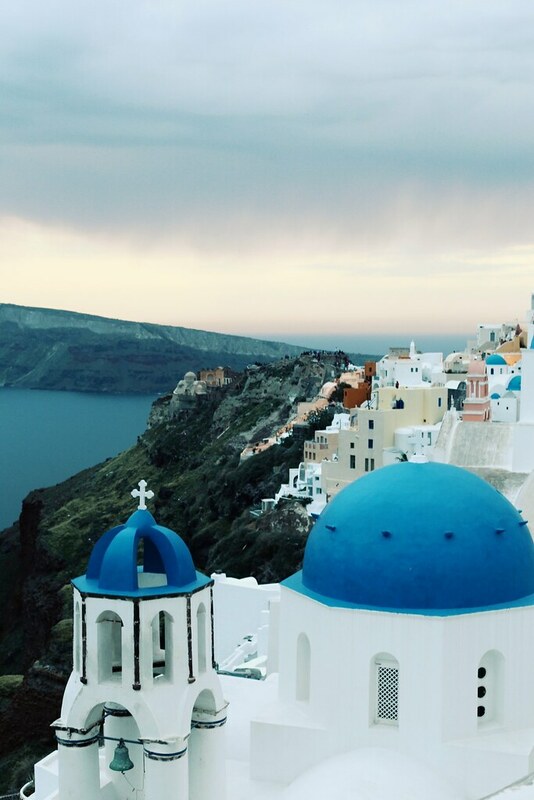 First up... Santorini. 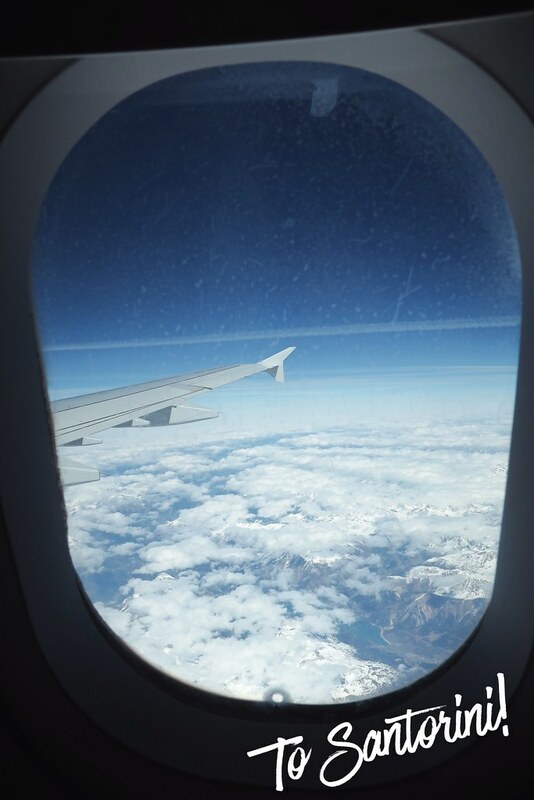 We flew over with Aegean Airlines, which is always a pleasure. 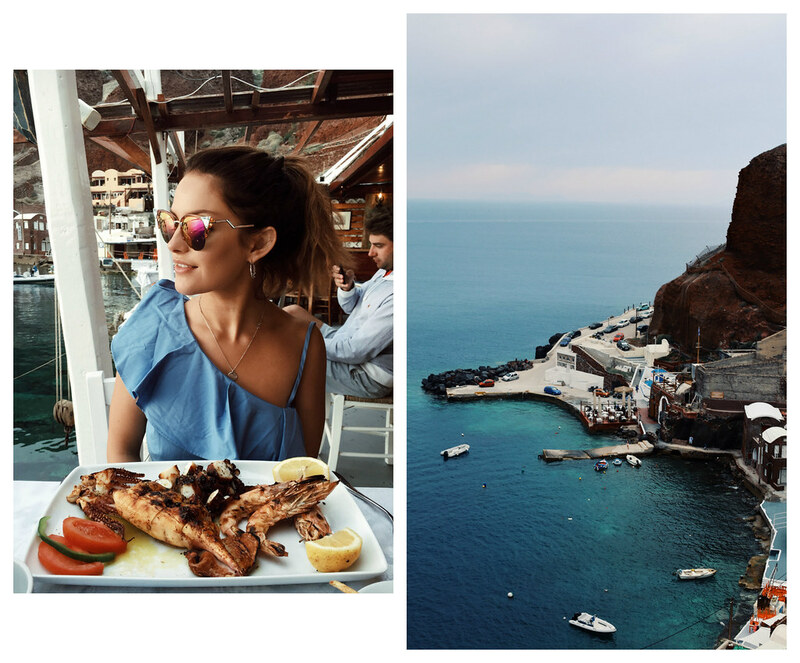 We went from London to Athens - there just so happens to be a post on Athens coming you way soon - and from there to Santorini. 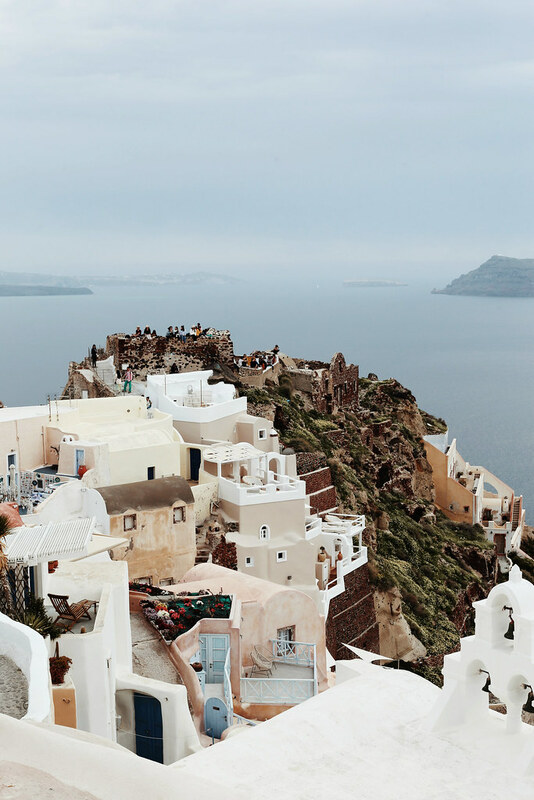 As you may well remember from a travel bucketlist I did many, many moons ago, Santorini has long been on my wishlist so I was so incredibly excited to land and explore. 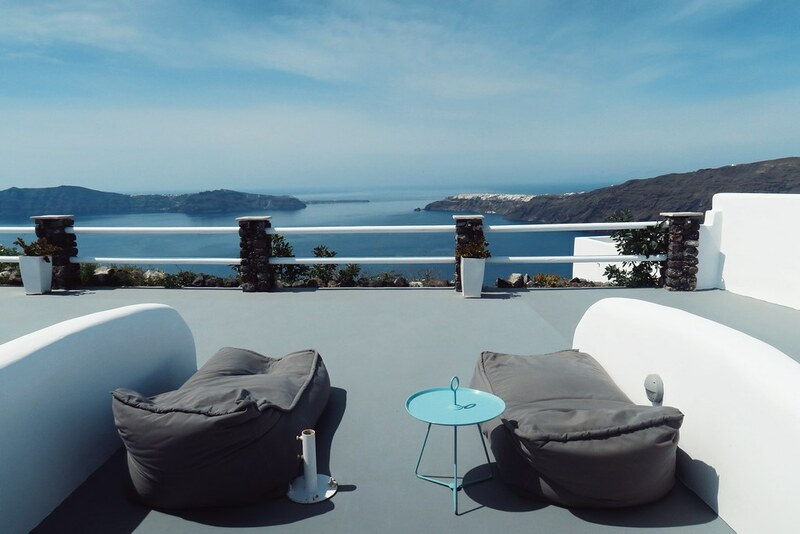 We got off the plane and headed straight for the beautiful Adore Santorini, which is located in Imerovigli and sits at the highest point of the Caldera ridge. 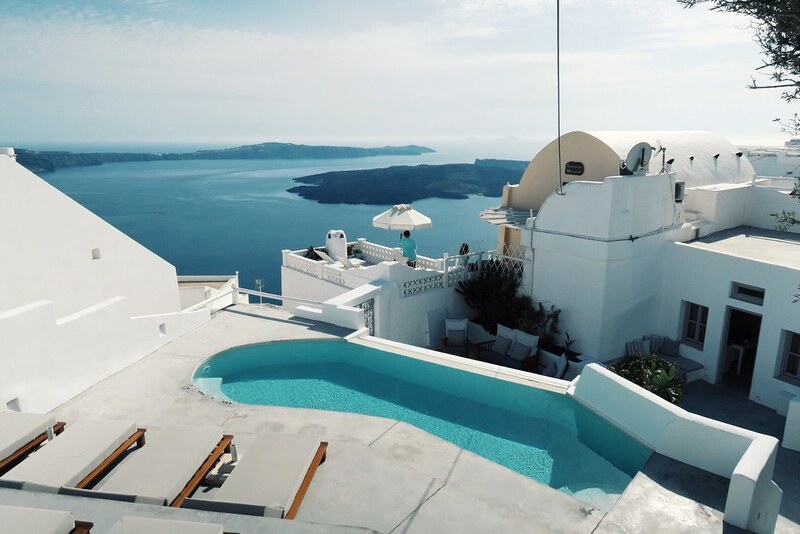 Because of this, the suites have really beautiful views right up to Oia (which you can see in that last photo there, Oia is at the tip of the crescent) as well as being an amazing place to watch the sunset from. The rooms are small but have everything you'd need for a couple of days stay, complete with a little hot tub and some very comfy loungers in the back. We were there in early April when it's still relatively chilly - around 16 degrees - so the hot tub was, now I don't want to exaggerate too much and say it was a life-saver, but, y'know, it really was wonderful. 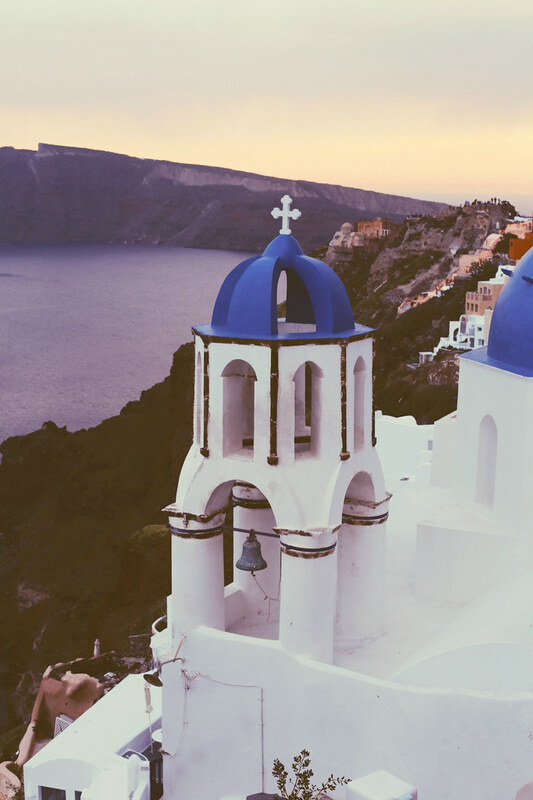 We sat in it most nights and watched those oh-so-famous Santorini sunsets, which are even more amazing in real life. 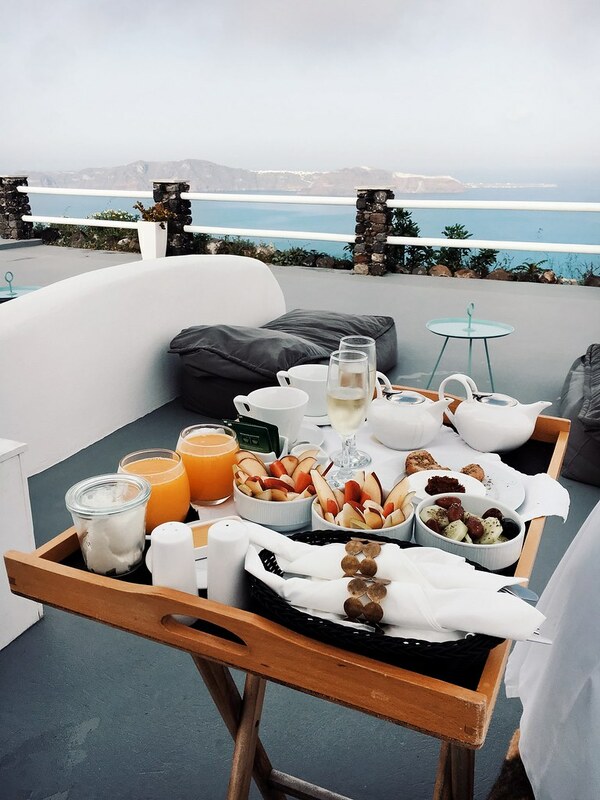 We also had a lovely breakfast every morning; you select what you would like the evening before and then - hey presto - in the morning it's set up on a little tray for you outside your apartment at whatever time you request. Our stay was made even better by Dimitris the lovely manager, who couldn't have been more lovely and helpful, answering all of our questions and making sure that we knew everything about the island that we needed to know. The first day was spent exploring the surrounding area by foot. 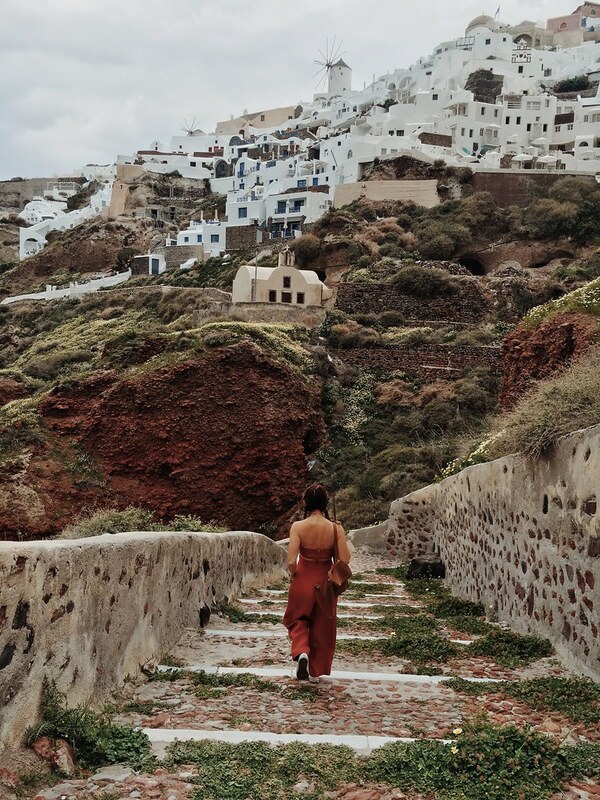 We walked from our apartments right down to Fira and Firostefani and took in the beautiful views along the way. 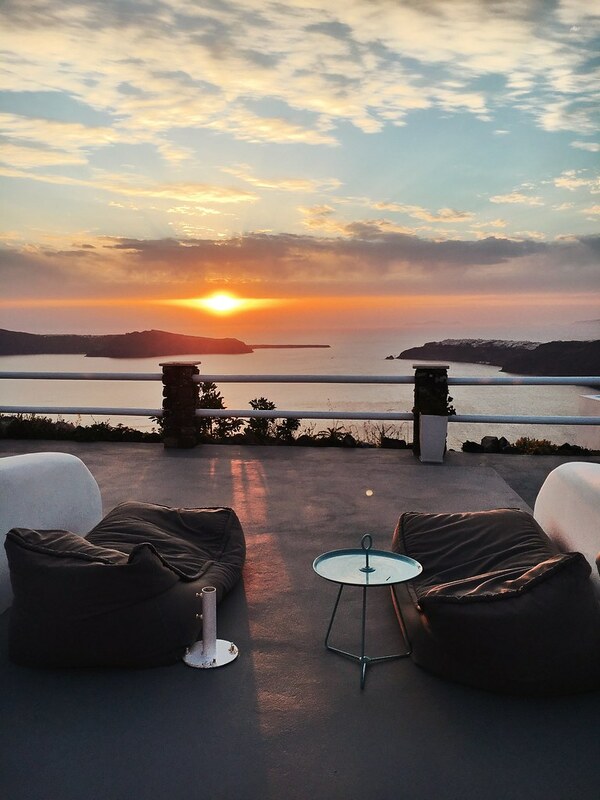 After a long day of walking and stopping for tea and coffee and ice-creams a-plenty, we stopped off at the incredibly picturesque Above Blue Suites for a sunset drink and some fresh fruit, before heading on to The Bone restaurant. 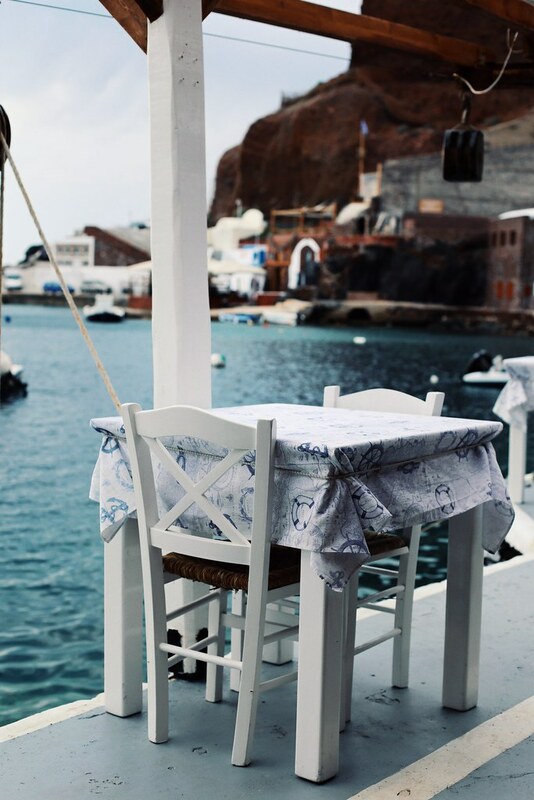 The menu's filled to the brim with delicious Greek food, with our favourite dishes being the halloumi starter (it was always going to be the halloumi, wasn't it? You just can't beat it) and the steak, which many claim to be one of the best steaks they've had. Not a bad way to spend a day, I have to say. The next morning we got up early, hired ourselves a scooter and prepared for the journey to Oia. I say prepared, it's literally a 15-20 minute ride, it just sounded more epic that way. 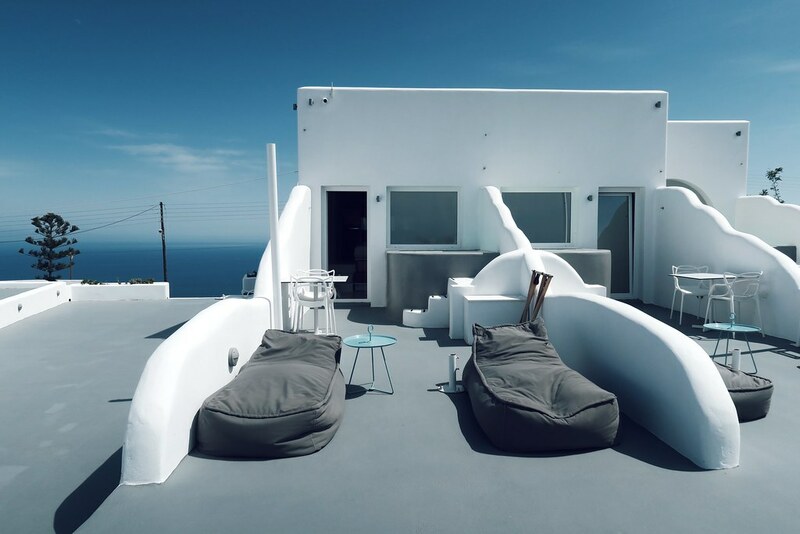 ...Oh, Oia. I don't think my words can do it any more justice than the above photos can. It's SO beautiful. Like everything you'd imagine from all those Pinterest images you've seen and more. What I would say is that we were there right at the beginning of the season (early April) and it was already very crowded so, if you can, then I'd try to avoid going slap bang in the middle of summer. 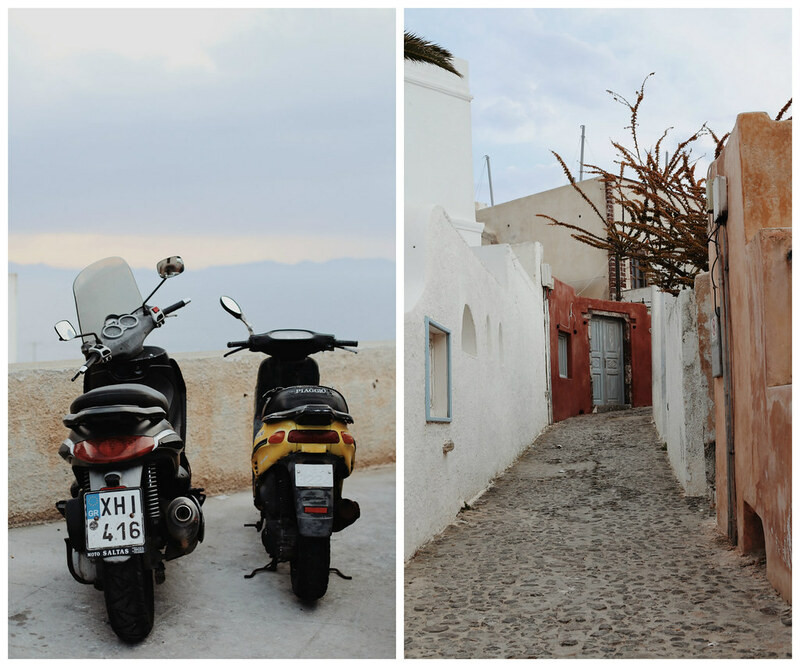 We spent most of the day just wandering around the little streets, eating ice cream and taking it at our own pace. We went down to Dimitris Taverna for a big ole seafood lunch - and when I say big, I mean big... I think I had half the ocean on my plate - against the most beautiful backdrop. 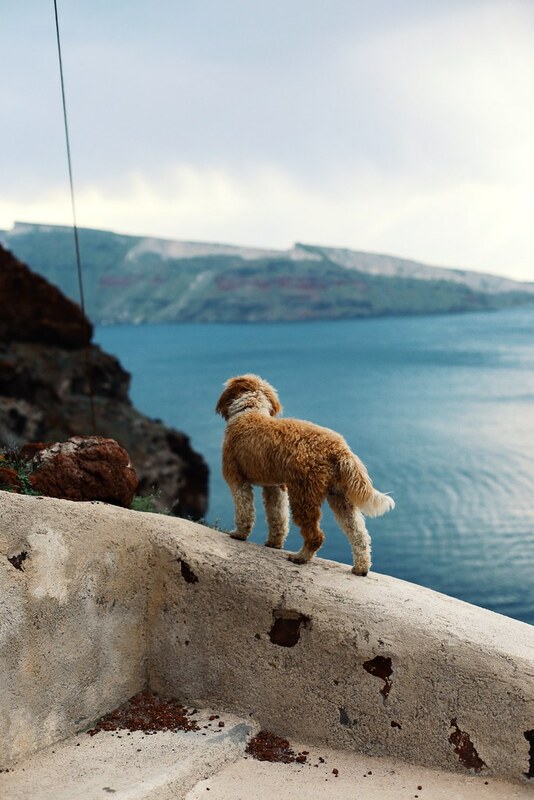 As we started to make our way back up to the main part of Oia, we were met at the bottom of the hill by world's cutest dog (who you'll see in the photos below), who proceeded to lead us all the way back up the hill, all 200 or so steps. He even stopped along the way to look back and check we were following. This, combined with how cute he was and how beautiful the views were, meant my thought process quickly turned from 'Aww' to 'Oh... god. Have I actually died? Did I eat a bad bit of seafood and this is my spirit animal leading me to Heaven?'. Thankfully we reached the top and parted ways with our furry friend with no golden gates awaiting. 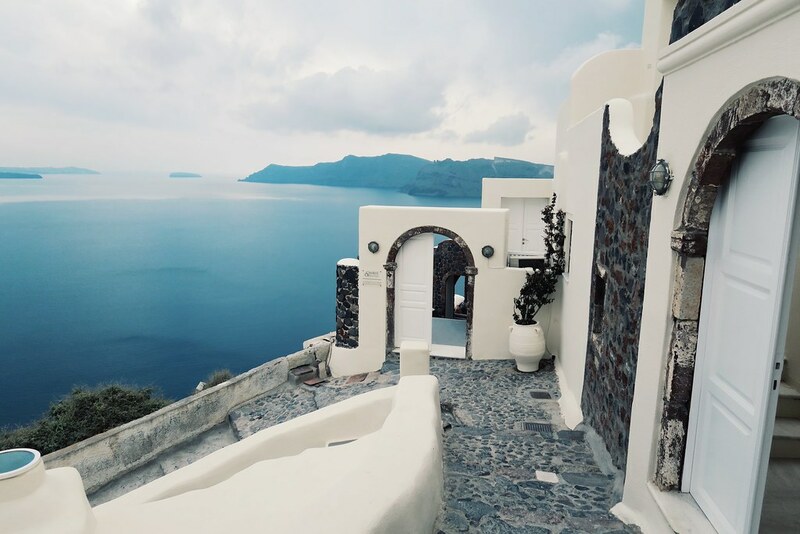 Just more spectacular Santorini views as the sun started to fall. 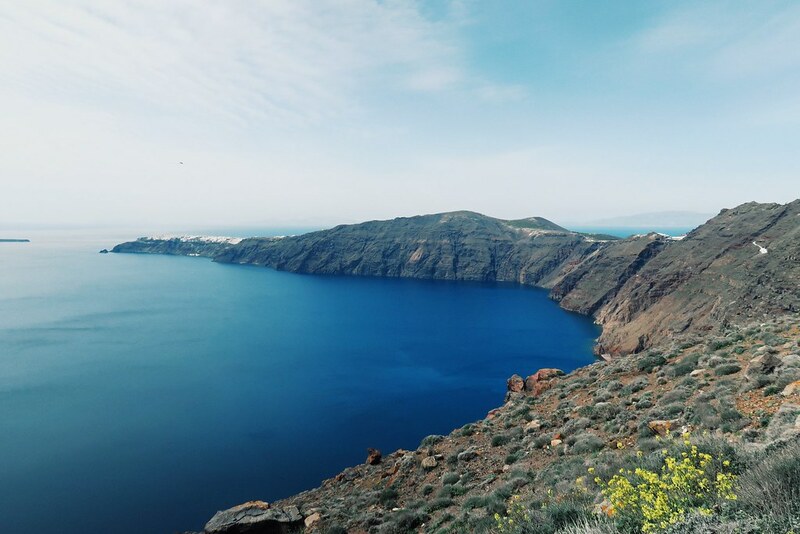 One thing that did surprise me about Santorini as a whole was how green it was. 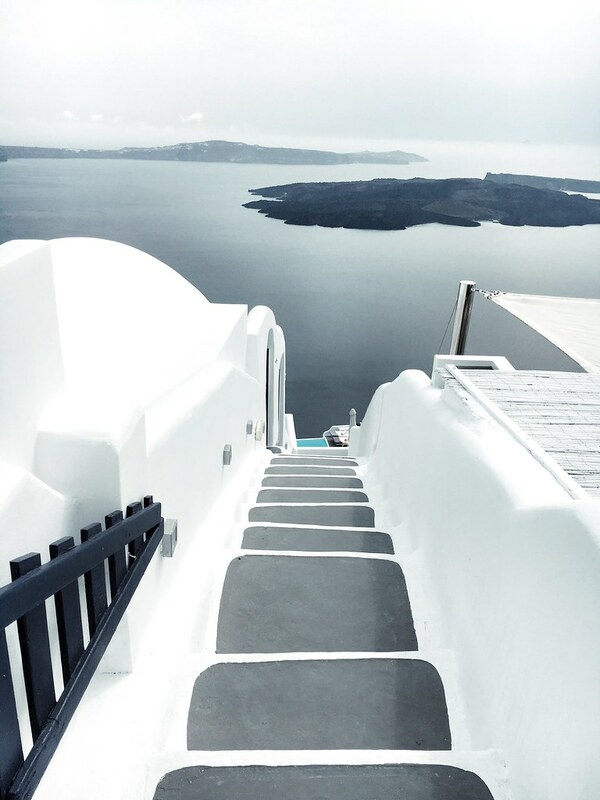 You see so many photos of the blue domes and white buildings, but there's this whole other kind of rugged aspect to it that was completely unexpected; like the photo of me above walking from behind - never in a million years would I have guessed that was Santorini if you'd showed me it. 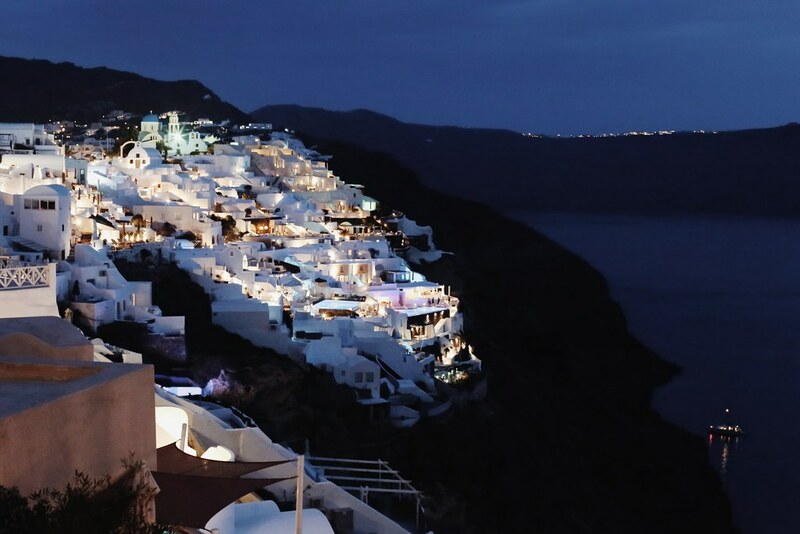 After watching one last sunset, we waited to see Oia in darkness (I can't decide if it's more beautiful during the day or during the evening when it's all lit up) and then hopped on our scooter back to Selene for dinner, which made for a really lovely last meal. The staff there were so incredibly lovely - and knowledgeable about gluten intolerance too - and made us feel so at home. Make sure and try the chocolate dessert if you go, it's made up to look like a little plant-pot and is seriously one of the tastiest puddings I've ever had! And that was it... time to go home. Not long enough to do everything we wanted (there are beaches, catamaran tours and wineries left unexplored) but enough to wet my whistle - sorry that's a horrible phrase isn't it - and leave me knowing I'd love to come back. 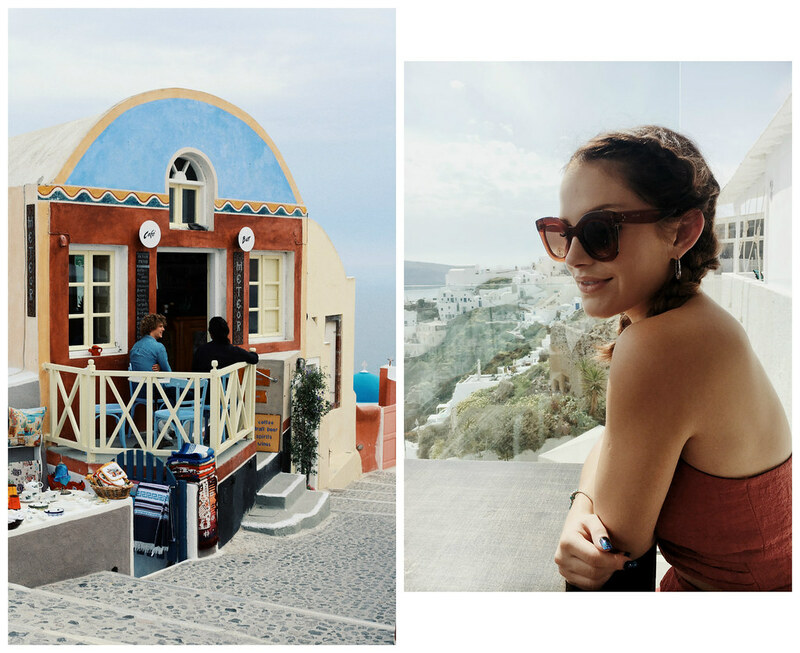 I really hope you enjoyed this post and, like I say, my Athens travel diary will be up very, very shortly! 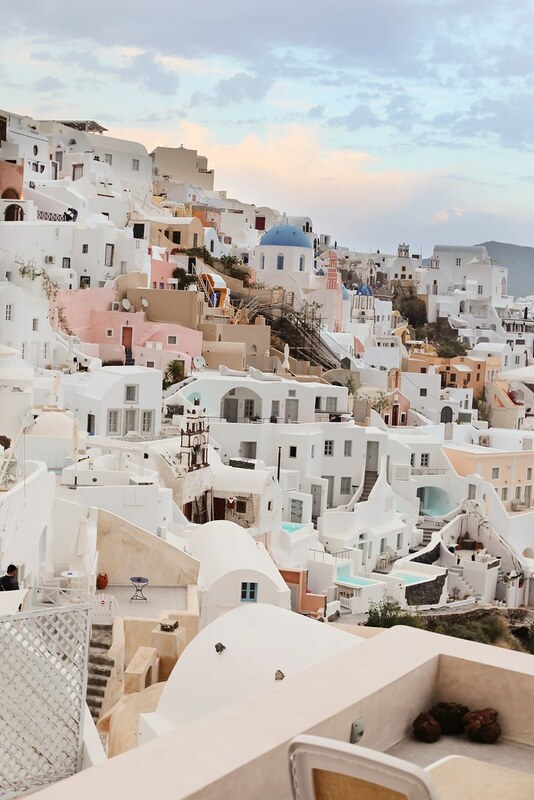 Santorini looks so cute! That is paradise. I'd love to visit, your photos are beautiful and making me want to go even more! These pictures are SO dreamy. 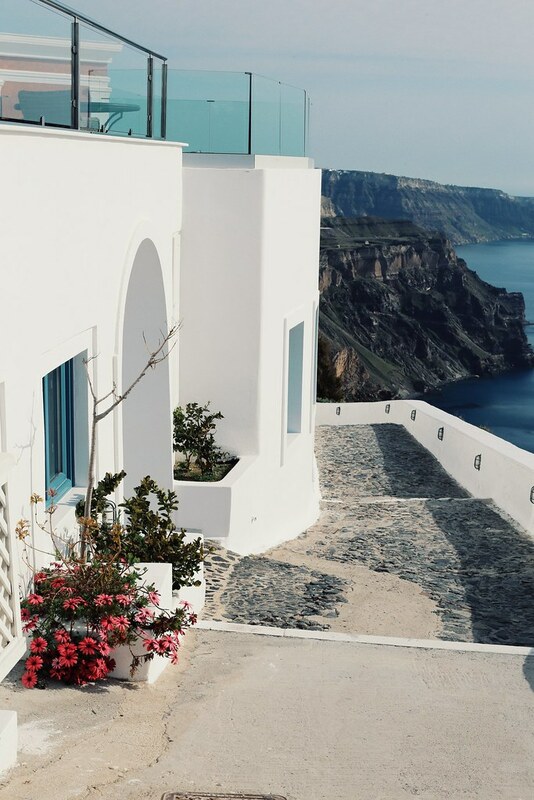 Greece is on my bucket list and this just reinforces my desire to go ASAP!! 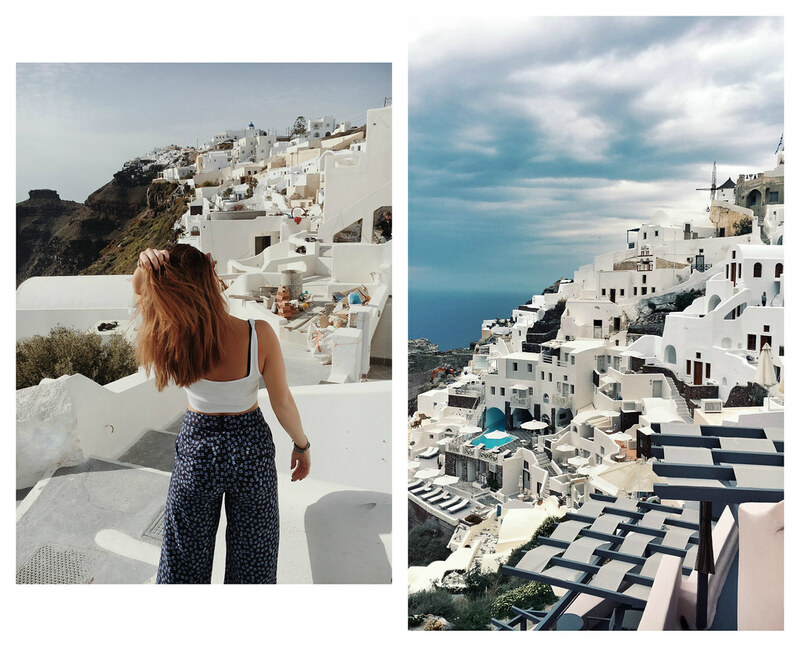 Wow, the views and the perfectly crispness of your photos. I love this. These photos are so gorgeous! 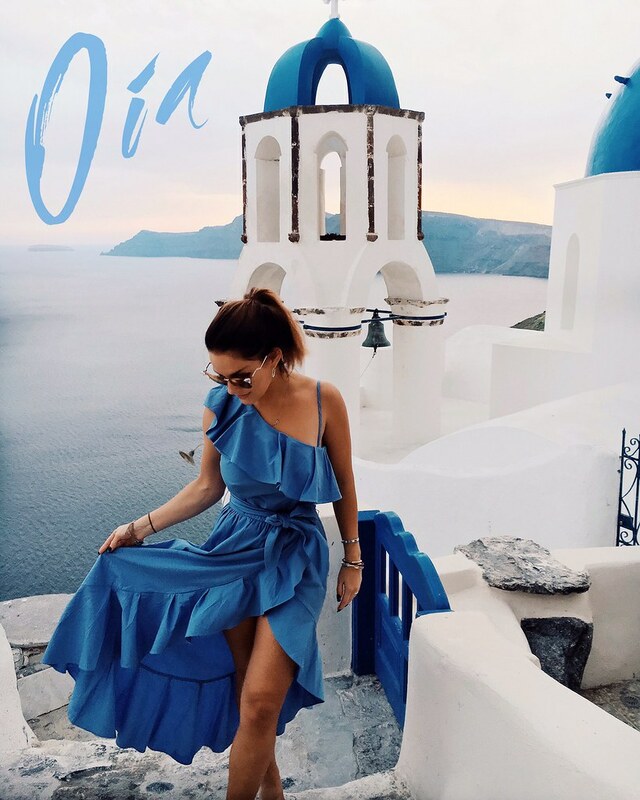 Love that blue dress you are wearing in Oia. 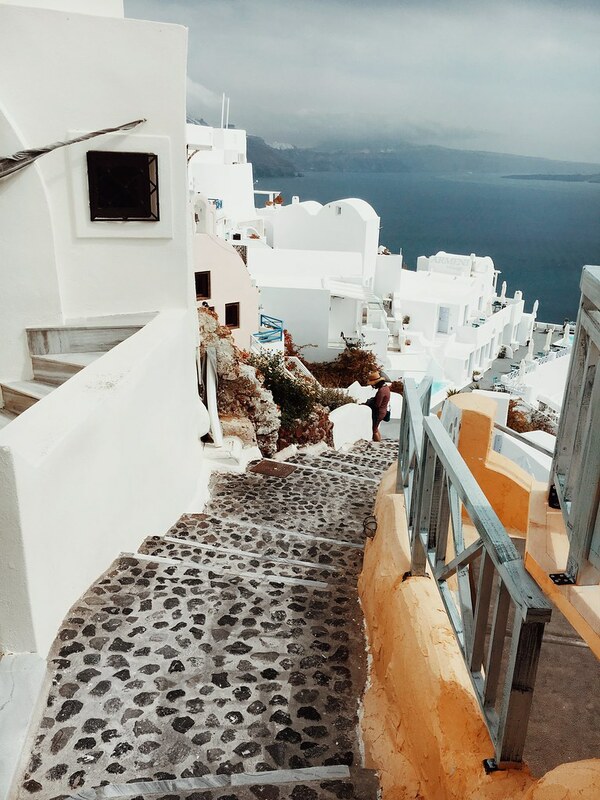 Santorini has been very very high on my travel wishlist for a while now, really hoping to make it there in the next year or so! 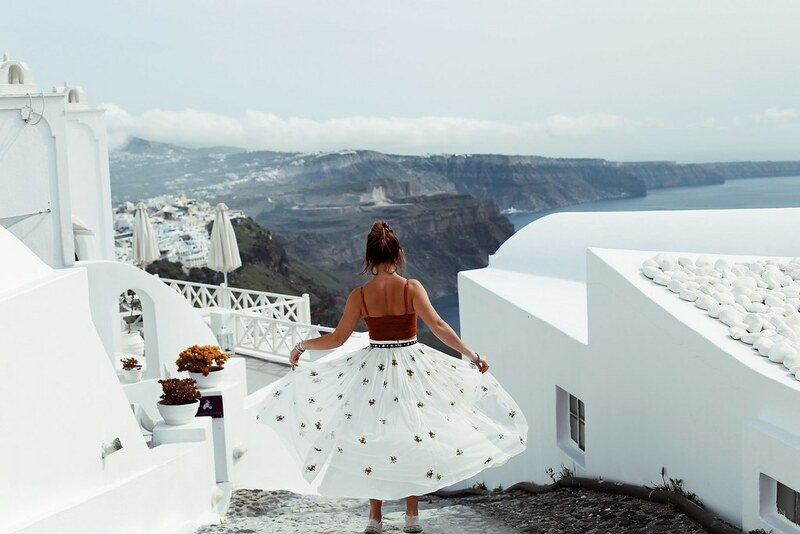 Santorini looks completely magical!! I hope I can visit it one day! 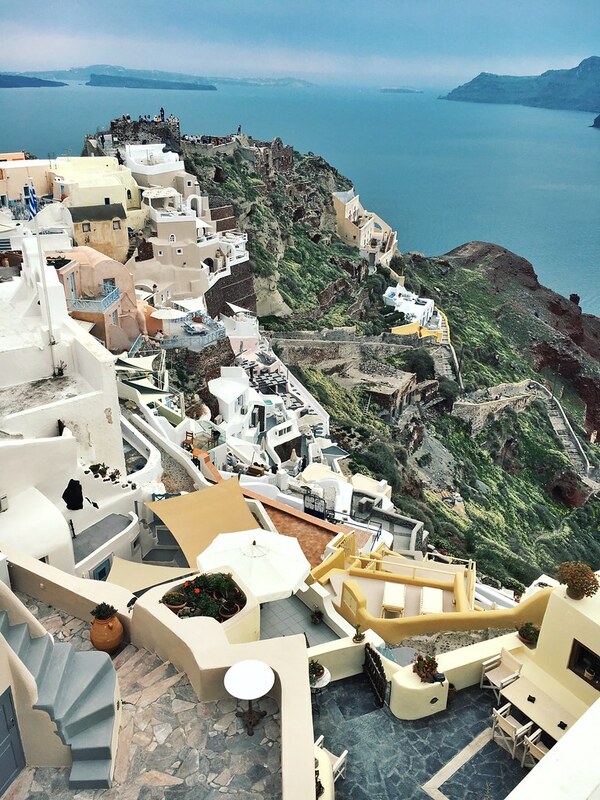 Thanks for sharing this travel diary! These photos are gorgeous! 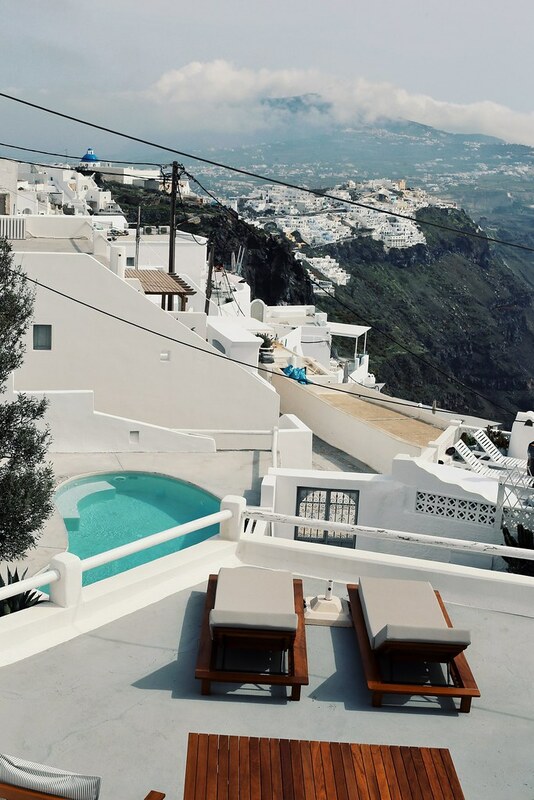 Santorini always looks like such a stunning place to visit. I'd love to go, but people say there isn't too much to do there. How long would you suggest going for? 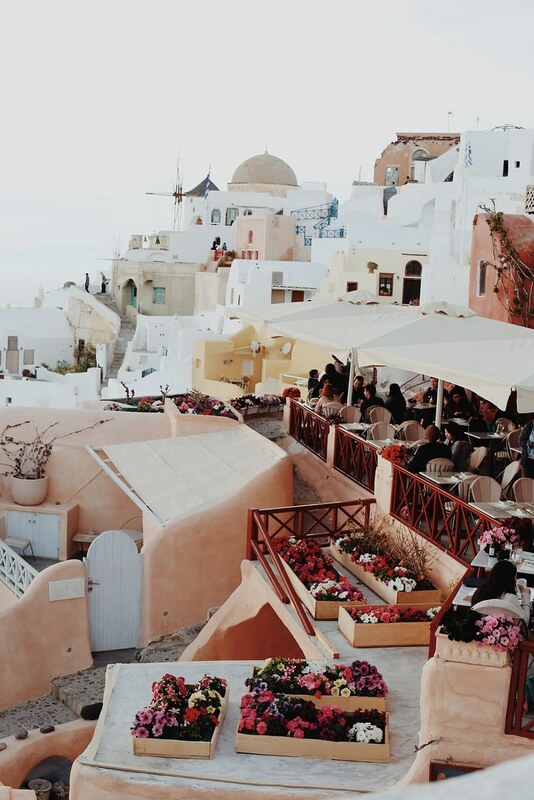 Such an amazing post and Santorini is on my bucket list for so long now. And your pictures defitnily proved why, it seems like such a gorgeous place. 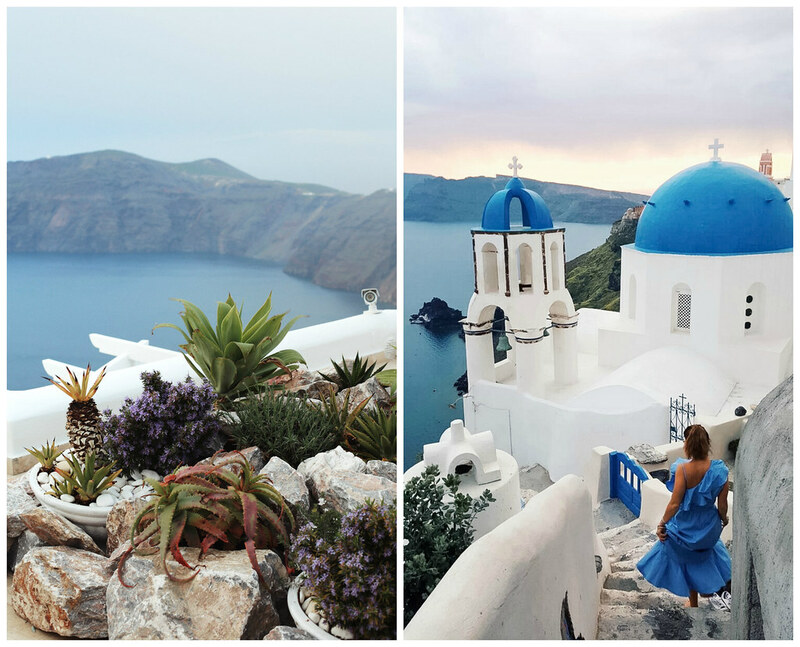 okay, so Santorini should be asking to use that photo of you in that blue dress as like their main advertising image - you and the island look bloody amazingggg! 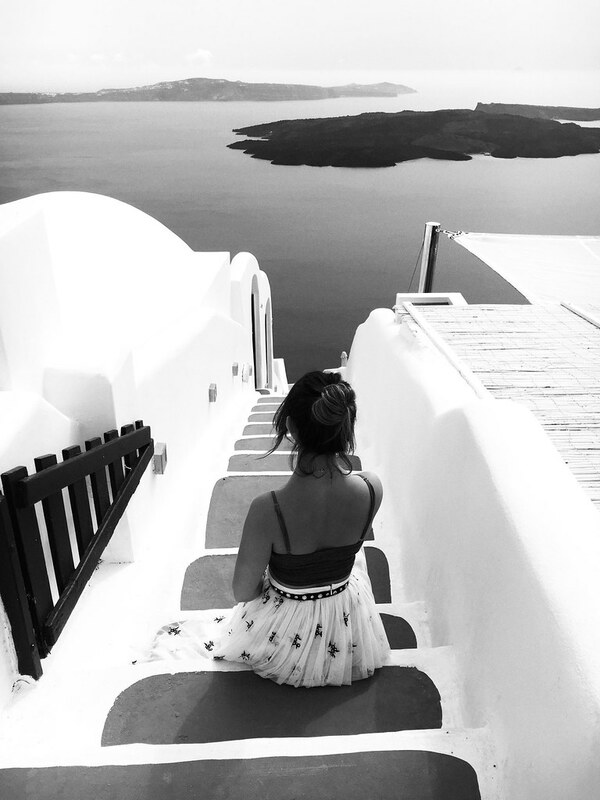 I love photo diary type posts and these photo's are absolutely beautiful! 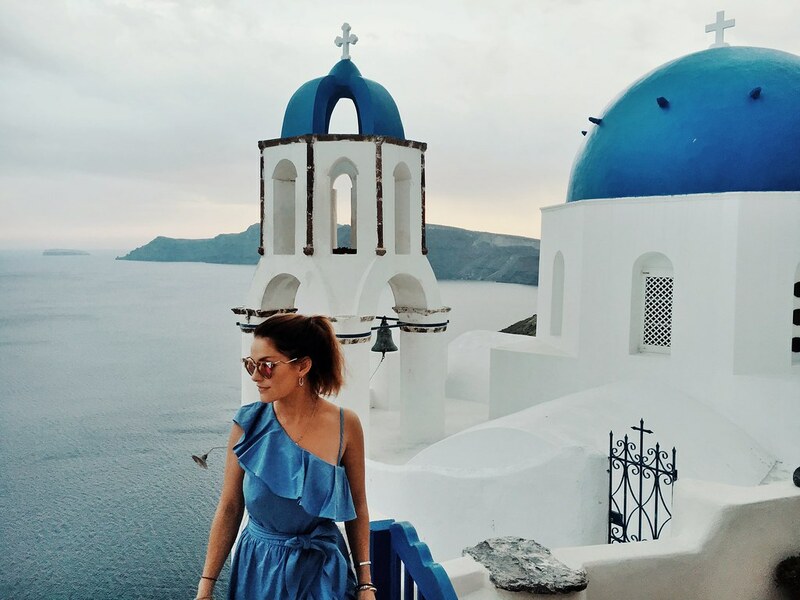 Makes me want to book a trip to Santorini :( all your outfits are spot on too, I swear you never look anything but beautiful! This place looks magical. Really want go here someday! 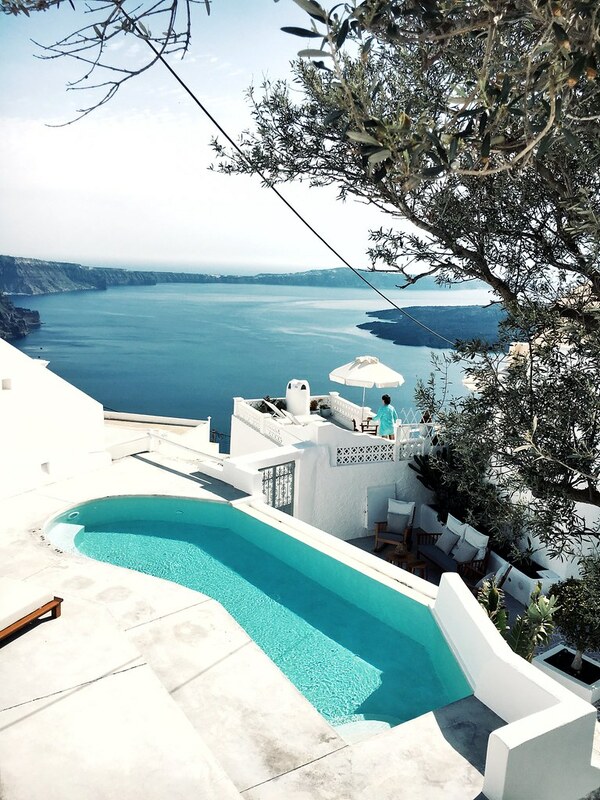 Greece is a secret paradise on earth. 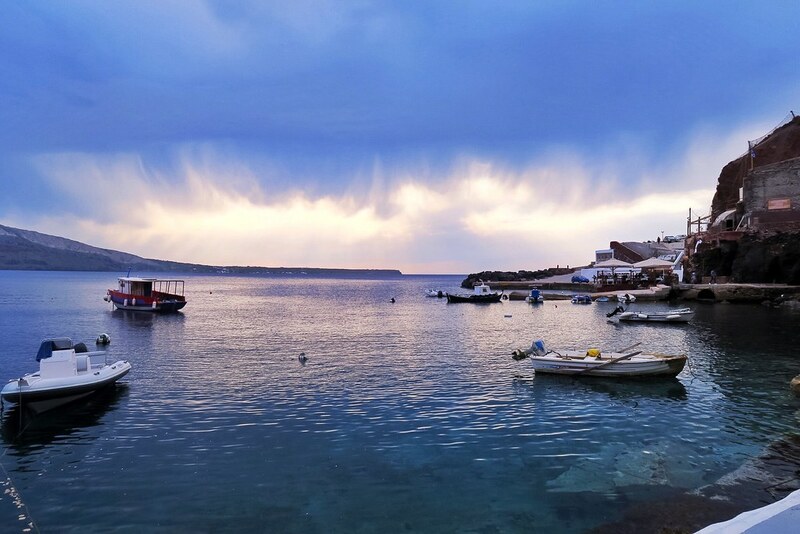 Except islands, there are very interesting places like peloponnisos, chalkidiki, meteora, athens, thessaloniki, north sporades, creta...!!! OMG! 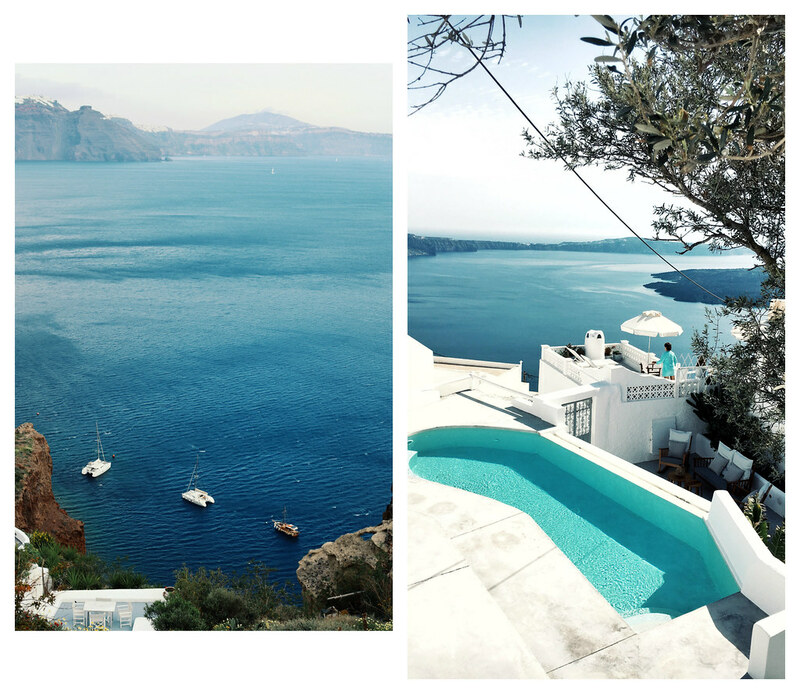 these pictures make me want to board the next available flight to Santorini. It's so beautiful. 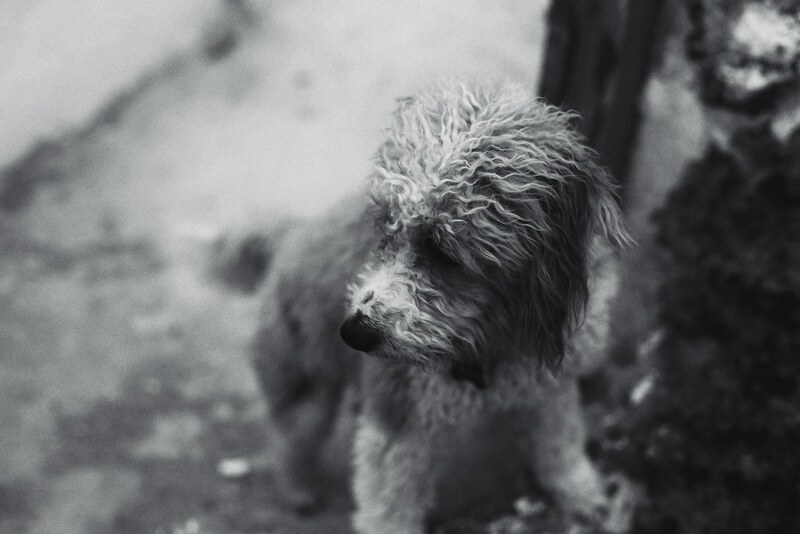 I hope that you saved that little dog and did not let him fall off of that high wall! Hi, Every One Out Here.